We’re getting ready for spring, but don’t miss these featured winter plants! 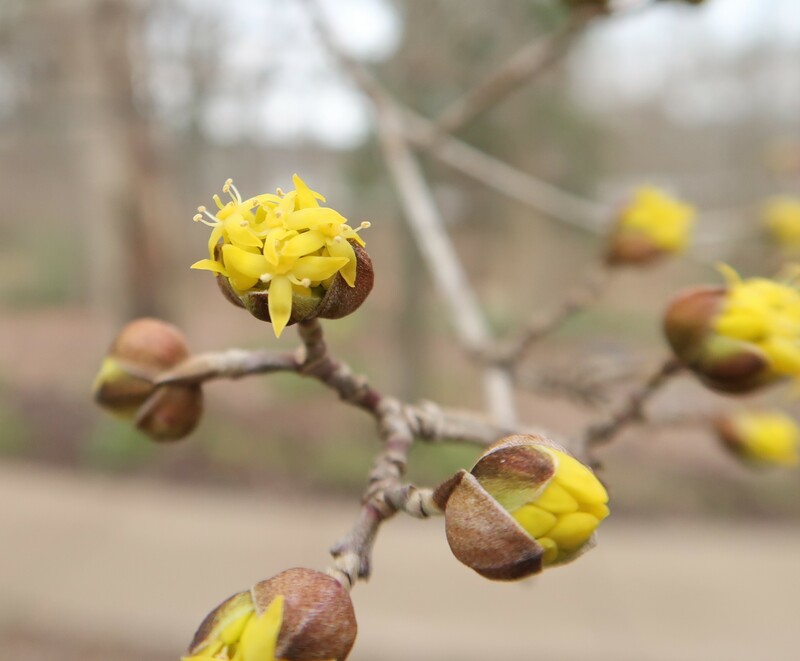 The Cheekwood garden team has hand selected their top plant picks for February from 8 of our distinct gardens. Use this as your guide as you explore the grounds. Arguably, one of the best boxwood selections to use as a landscape accent. With its upright, narrow-pyramidal form, it can easily be pruned (in late winter, preferably) into a conical shape. ‘Dee Runk’ can possibly reach an ultimate height of 8 feet tall, has dark green foliage, and a considerably high tolerance to boxwood blight and other disease. The specimen at the Howe Garden’s tool shed entrance is truly outstanding. It appreciates a bit of shade, but it will perform fine without it. Good drainage is a plus and if limestone soil is available, then you have the perfect soil conditions for any boxwood. Blooms occur in May, and are fragrant, though perhaps not preferable to the nose. 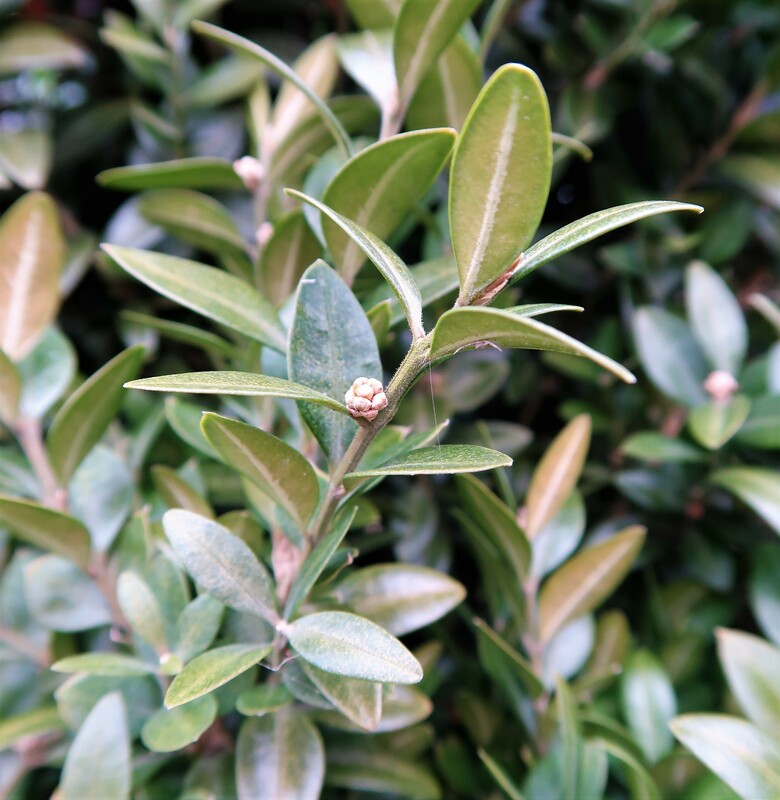 Native to southern Europe, Africa, and Asia, we have long associated boxwood (named so because of its exceptionally tough wood that lends itself to good carving) with formal gardens. The Cheeks were sure to use this tradition in their own landscaping and many of the original boxwoods remain on the property surrounding the Cheek mansion. Though ubiquitous to the South, one may not realize that crapemrytle is actually a non-native. Upon its introduction to the United States in the late 16th century, it fit right in with all things Southern. With its high tolerance to heat, humidity, and drought as well as its ability to withstand a range of soil conditions, Lagerstroemia was gracing Southern courtyards in no time. Known as a “tree-type” crapemyrtle, ‘Muskogee’ is just one of many beautifully successful breeding results of the highly regarded Dr. Don Egolf, late plant scientist and horticulturist for the Unites States National Arboretum, who crossed the Japanese crapemyrtle (fauriei) with, the Indian species (indica). It is from the Japanese species, that the results of these crossed inherited mildew resistance. Dr. Egolf focused on superior selections of several woody plants including viburnum, redbud, and hibiscus. ‘Muskogee’ features prolific, light lavender flowers from July until September. The fall foliage color is a remarkable red. The bark, exfoliating to expose silver and tan shapes, provides the Color Garden with a rich and solid backdrop during all seasons, as the allèe display, past the arches on the path toward the Japanese Garden, can attest. 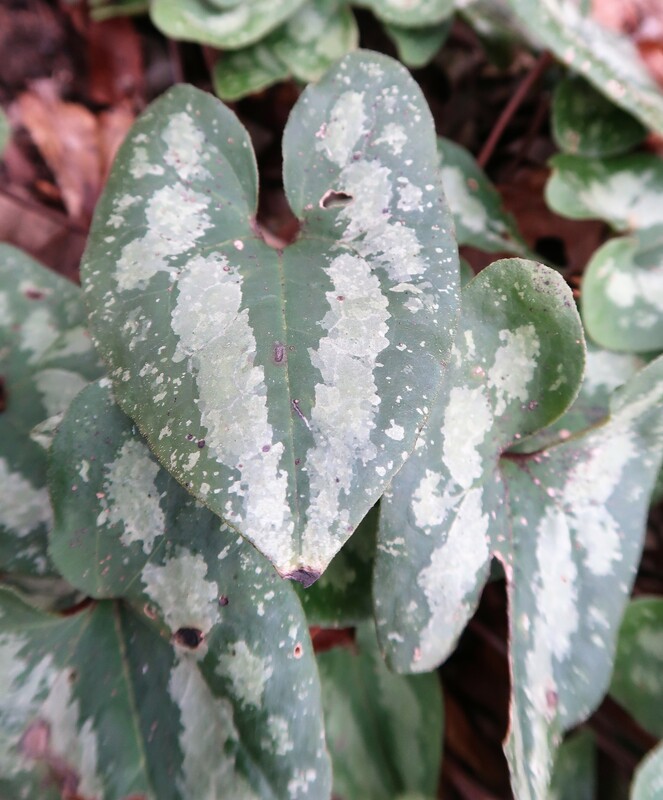 An evergreen groundcover (semi-evergreen in colder climates), with dark green and silver-mottled, heart-shaped leaves, Asarum splendens should not be confused with its North American medicinal cousin, A. canadense (snakeroot). A nice collection of Chinese wild ginger, with the signature metallic markings, is growing in the shade bed above the herb garden’s tool shed. It appreciates slightly acidic soil and constant moisture with good drainage. It can also tolerate heavy shade. Pollinated by ground-hugging insects, the urn-shaped flowers borne underneath the foliage have been coined “little brown jugs”. They are like a well-kept secret and are especially fun to share with young nature enthusiasts. Winter Jasmine is a common selection for banks and an excellent plant choice for walls where the branches have the opportunity to cascade. From China, and introduced to North America in the mid 1800’s, the foliage is glossy and dark green throughout the summer. The bright yellow, tubular flowers are non-fragrant (unlike those of Jasmine officinale) and open over a long period of time on naked stems, from January to March, peaking in February. Favoring full-sun to part shade, J. nudiflorum tolerates a considerable amount of shade as well as poor soil conditions. 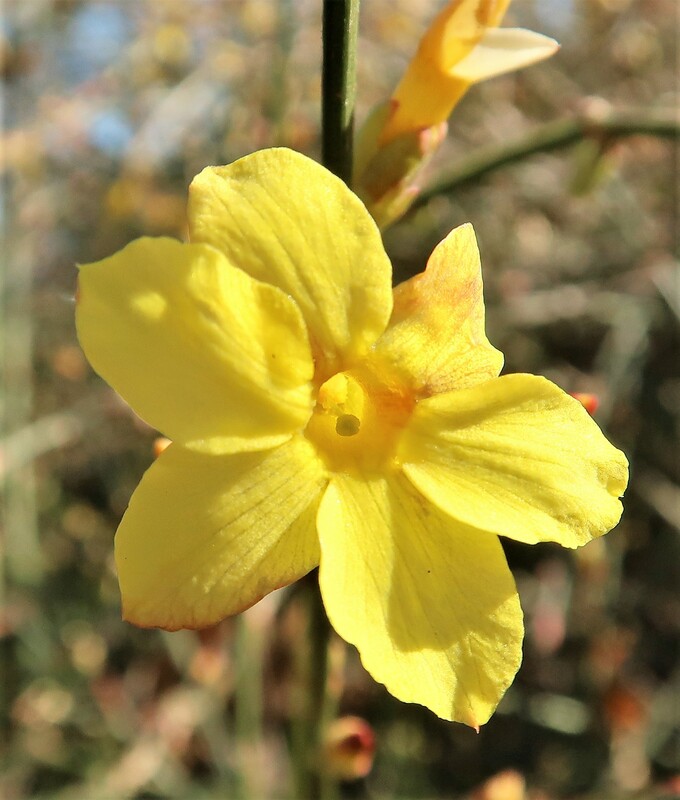 Naturally possessing a mounding shrub-like habit, winter jasmine can also be trained to grow as a vine. Thought by many to be one of the most beautiful conifers, the pendulous pyramidal form Tsuga canadensis takes on with maturity is stunning. Used commonly as a specimen (this specimen near the reflection pool has been with us for 19 years), but Canadian hemlock also makes for a beautiful and graceful hedge. 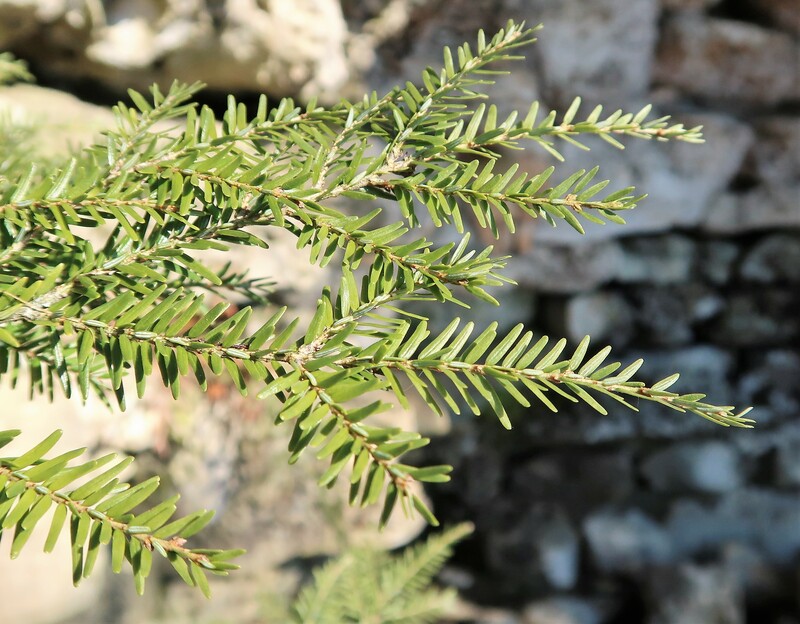 Called “Canadian” hemlock, though it is native from Nova Scotia to Minnesota and can be found along the mountains south to Alabama and Georgia. It performs well on slopes and tolerates full sun only in cooler regions. It requires protection from the sun in hot and humid climates. ‘Jedelloah’ will reach an ultimate height of 15 feet tall and width of 20 feet. Small, tan cones will appear on established trees. Native to China, Japan, and Korea, it is a shrub by habit, though our collection of Cornus officinalis looks more like small trees at this point. Donated to Cheekwood by the Mr. and Mrs. Monroe Carell (the garden’s namesake) in 1985, these five specimens line the dogwood walk upon the slight slope along Parking Lot B. Like Cornus mas in many ways, including bloom season and the yellow color, it does flower one week earlier, and has a more open branching habit. 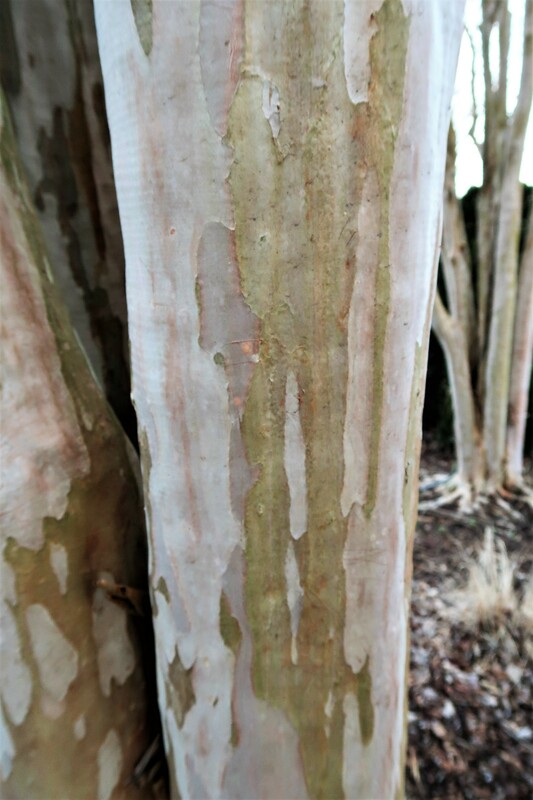 Corneliancherry’s bark is brown with gray tones. The flowers occur on bare branches, a unique and hopeful sight when the air still feels frigid. Brightening the Turner Seasons Garden with its happy chartreuse, our young specimens of C. macrocarpa are originally native to the Monterey peninsula of California. 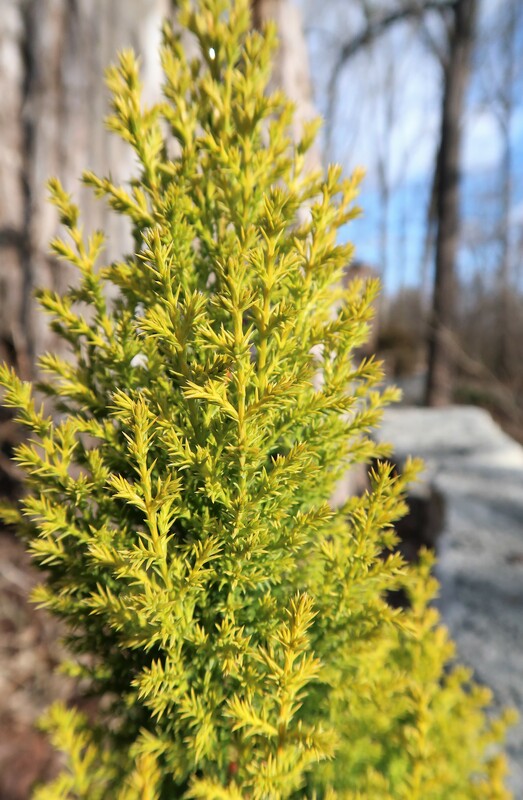 When provided with full sun Monterey Cypress will tell its best color story. Compact and narrow in habit, it can reach a maximum height of 12 feet if growing conditions are favorable, though the average height in a span of 10 years is approximately 5 feet. The fragrance of the foliage is lemony and refreshing. It thrives when grown in warmer climates and can also be a success as a houseplant. Winter interest has become this plant’s main purpose in a landscape. Its curly, corkscrew shaped branches can only be appreciated once the papery leaves have shed. 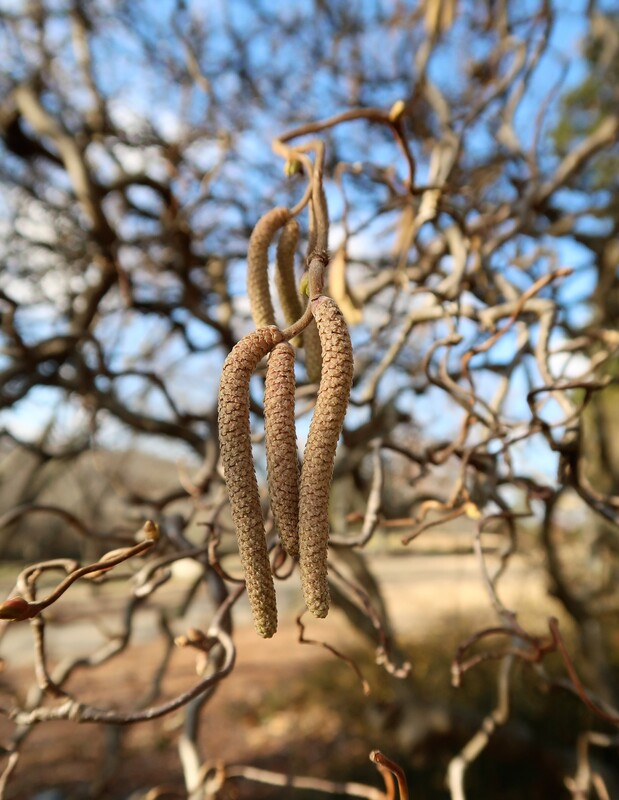 The sessile-shaped catkins are somewhat showy, also providing something to admire during these cold months. The species is native to southern Italy, though the cultivar, ‘Contorta’, was first found as a sport in an English garden during the mid-1800’s. A few years later, the popular common name “Harry Lauder’s Walking Stick” was attributed to the plant in honor of the Scottish vaudevillian actor, Harry Lauder. In addition to the specimen located at the lower stream, there is a younger one growing in the Sigourney Cheek Literary Garden. If you are growing this variety of Corylus in your garden, be aware that if the removal of suckers is ignored, the plant may eventually revert to the rootstock’s non-contorted form.